His Dark Materials TV Series in the Works | Nerd Much? Fantasy novel enthusiasts rejoice, as BBC One and New Line Cinema have announced that a His Dark Materials TV series is in development. The upcoming fantasy TV series will adapt Philip Pullman’s epic trilogy of fantasy novels for BBC One as an event series, with New Line Cinema producing the venture, according to Deadline. This isn’t the first time we’ll see the source material on the screen, as 2007 saw a feature adaptation in the form of The Golden Compass, which starred Daniel Craig and Nicole Kidman. Unfortunately, the movie released to little critical fanfare, although it went on to make $370M worldwide. 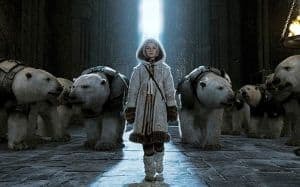 The His Dark Materials novels revolve around orphan Lyra, a girl living in an alternate universe in which science, theology and magic are all entwined. The first book in the series, Northern Lights, sees Lyra searching for a missing friend in the middle of a twisted plot involving stolen children and a mysterious Dust. The second book, The Subtle Knife, sees Lyra joined by a boy named will who has a knife that allows the duo to transfer between alternate universes. Finally, the third book, The Amber Spyglass, concludes the series. Of course, it’s still early on in the stages of development, so there’s no director nor cast attached to it just yet. However, we’d like to throw Game of Thrones and Doctor Who star Maisie Williams‘ name into the hat for the leading role. Stay tuned to Nerd Much for more on the His Dark Materials TV series, as we’ll be following this one closely.